OBJECTIVE: To determine the contribution of school lunchboxes to the daily food intake of adolescent girls in a school in an informal settlement in Durban, South Africa. METHODS: The study was conducted among a group of 61 secondary schoolgirls aged 13 - 18 years. Two 24-hour recall questionnaires were completed during an interview with participants to gather data on dietary patterns over a period of two consecutive days. The researcher weighed and recorded the contents of randomly selected lunchboxes. RESULTS: The lunchboxes contributed one-third of the daily nutrient intake of the children. 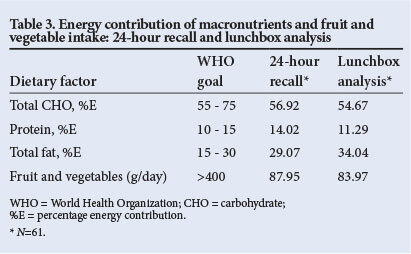 The 24-hour recall and lunchbox content data revealed an energy-dense, carbohydrate-based diet. The contribution of total fat (34.04%) to the total energy intake of the girls was higher than the World Health Organization (WHO) recommendation of 15 - 30%. The daily fruit and vegetable intake (87.95 g and 83.97 g according to 24-hour recall and lunchbox analysis, respectively) was insufficient compared with the WHO-recommended intake of >400 g/day. Although the mean intake of most of the nutrients was sufficient, a large number of the girls did not receive the daily requirements for this age group. CONCLUSION: The results of the study indicated a high-fat diet low in fruits and vegetables. The majority of respondents consumed carbohydrate-based food items and their lunchbox contents did not meet the basic requirements of a balanced diet. Although increased dietary needs are seldom met in adolescents, overweight is an emerging problem among young people in both low- and high-income countries. Nutrition education in this age group should concentrate on healthy food choices in school lunchboxes, as school children can spend up to 8 hours a day at school. No provincial prevalence rates for lunchbox food consumption were available for adolescent girls in SA. This study is one of the first to report on the lunchbox contribution to daily food intake of adolescent girls in the province of KwaZulu-Natal (KZN). No comparative studies could be found from any other part of Africa. To examine the dietary contribution made by school lunchboxes to the daily intake of adolescent girls (aged 14 - 18 years) in Durban. This study was undertaken in a randomly selected informal settlement in an urban eThekwini municipal district. According to the KZN Department of Health (DoH), approximately 10% of the urban population live in informal settlements, which are often under-developed - a result of non-availability of economic and infrastructure resources needed for general health and well-being. The household profile of participants was similar to conditions described by the DoH. All girls in the secondary school (N=406) were approached in a classroom situation to participate in the study and caregivers were sent consent forms to complete. All girls in the school aged 14 - 18 years who resided in the Lindelani community were eligible to participate in the study. Boys, non-Lindelani residents and girls aged <14 years or >18 years were excluded from participation. The caregivers of 156 girls gave consent and the girls assented to participate. Only 61 brought a lunchbox to school on the randomly selected days; accordingly, the study included a sample of 61 children. The World Health Organization (WHO) defines adolescents as children between the ages of 10 and 19 years, and according to the United Nations Children's Fund (UNICEF), there are ~1.2 billion adolescents in the world. Adolescence is a significant period characterised by vigorous growth and maturation, and increased nutritional requirements. More than 20% of total growth in stature and up to 50% of adult bone mass is achieved during this period. Although the increased dietary needs are seldom met in adolescents, being overweight is an emerging problem among young people in both low- and high-income countries. In developing countries, 21 - 36% of adolescents have a body mass index (BMI) >25 kg/m2, placing them in the overweight or obese categories. A recent South African (SA) study by the Human Sciences Research Council indicated that 16.7% and 5.6% of girls aged 10 - 14 years were overweight and obese, respectively, which is higher than the corresponding 7.5% and 2.7% in boys of the same age. Adolescence is a high-risk period for weight gain, breakfast skipping and fast-food consumption. Furthermore, adolescents who are obese are likely to remain so into adulthood. Importantly, elevated body weight and BMI in adolescence represent risk factors for chronic disease in early adulthood. Studies on the food intake of adolescents have reflected an upward trend in total energy intake from away-from-home sources - in particular, fast-food outlets. [7-10] Fast-food intake increases with age and contributes to the daily food intake of children. High-fat items such as fried chips, vetkoek, fried fish, pies and boerewors are commonly reflected in the daily intake of children and cannot be looked at in isolation. In the Birth to Twenty study in SA, Feely et al. reported that school dietary patterns revealed that lunchbox use was not common at any age and decreased per age group (13-, 15- and 17-year-olds); this was even more so in girls. However, where the children had lunchboxes, the amount of each food present in lunchboxes increased as age increased and girls had a greater variety than boys. Popular lunchbox items were cheese, bread, fruit and fruit juice. The Durban University of Technology (DUT) approved the study. The study proposal was submitted in accordance with the SA Medical Research Council (MRC) guidelines for research on human beings as well as the Helsinki Agreement Guidelines. A lunchbox was defined as packed food or a snack brought from home to school for consumption during school hours. Six trained third-year and postgraduate Consumer Science Food and Nutrition students from DUT acted as fieldworkers and completed the 24-hour recall questionnaires for participants in one-on-one interviews with parents and children. The researcher was present at data collection points to ensure correct measurements. All questionnaires were checked for completeness each day after the fieldwork was completed, and the fieldworkers made contact with the respondents to obtain any outstanding data. The researcher conducted all lunchbox content surveys to ensure uniform measurements. A structured, 24-hour recall questionnaire was administered to the children by the trained fieldworkers, with the caregiver present, at the school and on two different days - one weekend and one weekday - in order to obtain quantitative, descriptive information about nutrient intake. A four-stage, multiple-pass interviewing procedure'131 was used to ensure valid and reliable intake data. A limitation of the 24-hour recall questionnaire is that it does not provide a reliable estimate of individual intake due to day-to-day variation;'141 therefore, measurements were taken on two separate days. Food models were used to quantify portion sizes and describe food items to participants. The children were asked to identify what they consumed from the time they woke up in the morning until the time of going to bed at night on one particular day. They were also requested to indicate, using food models or examples of utensil sizes, how much of identified items they consumed. The fieldworker enquired as to the food preparation method and whether items such as salt, sugar and sauces were added. If the caregiver had prepared the food, they were asked to comment. The average intake of the two days from the 24-hour recall was calculated for the various nutrients. Lunchbox content was measured using the weighed food record method, using a calibrated kitchen scale (MICRO CW, Scales 2000) measuring from 20 g to 30 kg in 1 g increments. The lunchboxes were collected and the contents weighed on random days of the week to ensure data reliability. Lunchboxes were collected before the first period started and students collected them at first break. Food was removed and weighed in front of the participants. This made it easy for the researcher to ask questions about preparation methods. Accompaniments were weighed separately with the scale set to zero, using greaseproof paper on the scale before any food item was placed on it. In cases where containers were required, the scale was returned to zero before food was added and recorded on a spreadsheet. Combined meals were separated into the various food groups using a spoon if possible: starch, protein, and fruit and vegetables. Combined meals were weighed and divided by a ratio established by visual identification, e.g. for a stew with rice, the researcher gauged the percentage of each (30:70 or 40:60) and calculated the content accordingly. Lunchbox content was measured once for each child. The dietary intake data from the 24-hour recall and lunchboxes were analysed by a nutrition expert using FoodFinder software (version 3.0), based on SA food composition tables and developed by the MRC. The nutrient intake of the participants (minimum, maximum and mean±standard deviation (SD)) was calculated for the group for each of the nutrients to determine the nutrient adequacy of the dietary intakes. The estimated average requirement (EAR) values were used as the recommended standard for estimating the prevalence of inadequate intakes within a group and the adequate intake (AI) levels used for those nutrients without an EAR. The top 20 most consumed foods were also identified for the 24-hour recall questionnaires and the lunchboxes separately. The mean daily dietary intake results for the girls are presented in Table 1 as measured by the 24-hour recall questionnaires and lunchbox analysis. The mean macronutrient intakes for the girls were sufficient, except for total dietary fibre (16.60 g), where 93.4% of the girls did not meet the AI for fibre considering the dietary reference intake (DRI) of 26 g for girls aged 14 - 18 years. However, all the girls consumed carbohydrate (CHO) (234.60 g) in excess of the 100 g/day EAR. The majority of the girls (88.5%) did not meet the estimated energy requirement (EER) as the group had a lower intake (7 503.00±1 985.68 kJ) compared with the DRI of 9 946 kJ. Although the average protein intake for the groups was adequate, 21.3% of the girls did not meet the recommended daily allowances. As a result of accelerated growth during adolescence, there is an increased need for energy and certain nutrients, specifically protein, iron, zinc and calcium. In the sample, the mean dietary intakes reflected AIs for all of these except energy and calcium. However, 21.3%, 49.1% and 37.7% of the sample did not meet the EAR for protein, iron and zinc, respectively. The median calcium intake was extremely low (383.70±231.36 mg/day) and all the girls consumed less than the recommended amount (<1 300 mg/day). The mean intakes for the group showed a deficiency of most vitamins, except vitamins B1, B2, B6 and B12; however, the prevalence rate for inadequate intakes was 67.2% for B1, 36.0% for B2, 39.1% for B6, 42.6% for B12 and 43.79% for vitamin C, respectively (Table 1). 20.27% to the DRIs for calcium, iron, zinc, vitamin A, vitamin B6 and vitamin B12, respectively. The lunchboxes contributed about one-third of the girls' daily nutrient intake (Table 1). 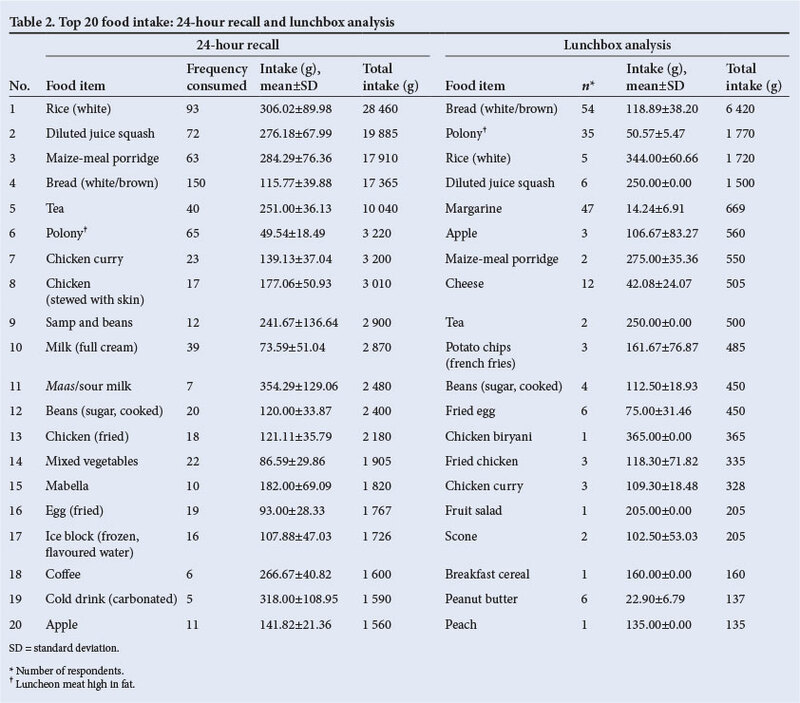 The top 20 food item lists for the 24-hour recall and the lunchbox analysis indicate that a large amount of items comsumed were CHO-based (Table 2). The top ten food items included bread, with a mean±SD intake of 115.77±39.88 g and 118.89±38.20 g for the 24-hour recall and the lunchboxes, respectively, followed by rice (306.02±89.98 g and 344.00±60.66 g), diluted juice squash (276.18±67.99 g and 250.00±0.00 g) and maize meal (284.29±76.36 g and 275.00±35.36 g). Protein appeared for the first time at number 7 in the form of chicken curry (139.13±37.04 g) according to the 24-hour recall. The protein that presented first on the lunchbox analysis list was cheese (42.08±24.07 g) at number 8; although chicken was presented often on the lunchbox analysis list, it was present in a limited number of lunchboxes. Fruit and vegetables appeared on the 24-hour recall list as mixed vegetables at number 14 (86.59±29.86 g), consumed 22 times, and an apple at number 20, consumed 11 times (141.82±21.36 g). In the lunchboxes, apples appeared at number 6, consumed by only three respondents, with one person presenting some fruit salad and one person a peach. Calcium-rich foods appeared at numbers 10 and 11 as full-cream milk (73.59±51.04 g) and maas (354.29±129.06 g) on the 24-hour recall; however, the milk was only consumed 39 times and maas 7 times, respectively. Cheese was the only form of calcium presented in the lunchboxes. High-fat items presented in the top 20 of the 24-hour recall included polony, fried chicken and fried egg; the lunchboxes contained polony, fried potato chips, fried egg and fried chicken. In comparison to the WHO goals for population nutrient intake for the prevention of death and disability from non-communicable diseases, the contribution of macronutrients to the total energy intake of the girls (i.e. 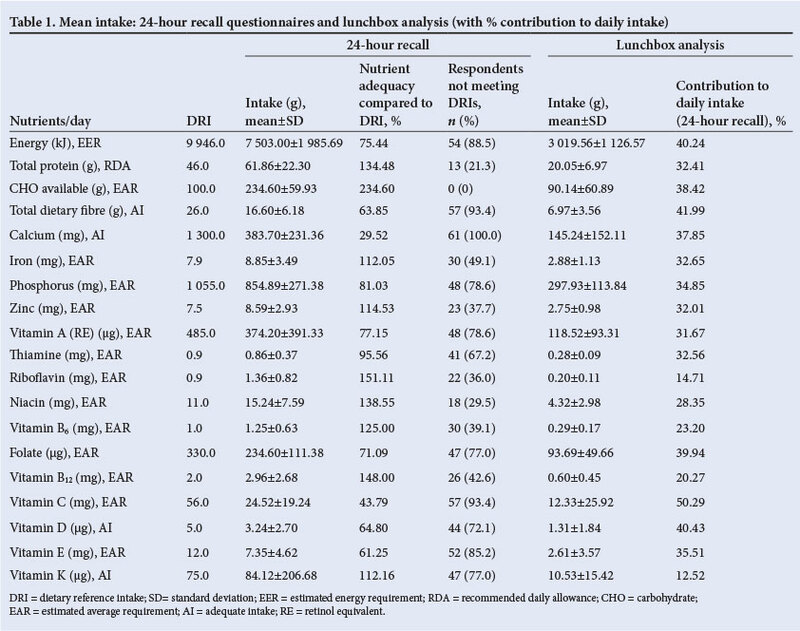 56.92% and 54.67% CHOs (including dietary fibre) measured by 24-hour recall and lunchbox analysis, respectively) (Table 3) indicated the consumption of a balanced meal (WHO guidelines stipulate 45 -65%). Protein (recall 14.02%; lunchbox analysis 11.29%) and dietary fat (recall 29.07%; lunchbox analysis 34.04%) intake were also within the guidelines of 10 - 30% and 25 - 35%, respectively, for children and adolescents. The daily intake of the girls reflected a fruit and vegetable portion of 87.95 g as identified in the 24-hour recall and 83.97 g in the lunchboxes - ~20% of the recommended intake of >400 g/day. This study examined the contribution of school lunchboxes to the dietary intake of adolescents girls attending a school in a low-income community in Durban. The motivation was the high overweight and obesity levels emerging in girls in this age bracket despite poor dietary intake in SA. [18-20] As measured by Hlambelo,'121 of the girls in this study (mean age 15.3 years) 4.9% were stunted (<-2SD to >-3SD); although the majority of respondents displayed normal height for age (95.1%) and normal BMI for age (49.2%), there were still high percentages who were at risk of being overweight (36%) (>+1SD to <+2SD), overweight (11.5%) (>+2SD to <+3Sd) and obese (3.3%) (>+3SD), necessitating an investigation into the actual food intake of the group. Furthermore, school lunchbox data for adolescents are very limited regionally and nationally. Adolescents and the youth are on the brink of adulthood when diseases of lifestyle may present as a result of poor food and dietary intake patterns, specifically high-fat and saturated-fat intake, poor dietary fatty acid composition and poor vegetable and fruit intakes,'221 combined with inactivity. A previous study'121 indicated that the prevalence of stunting and thinness/wasting in girls is less prevalent than being overweight or obese. The mean energy intakes for the girls were low when compared to the EER and the majority of respondents did not meet the EER. This could be explained by the fact that hunger and obesity can exist within the same household. '231 Furthermore, the transition from adolescence into adulthood is a high-risk period for weight gain. '6,241 International data have showed that adolescents, as a group, have a tendency to develop poor eating habits that do not meet dietary recommendations. '24,251 A number of studies have shown that adolescents consume high amounts of fat, and non-nutritious, energy-dense foods are very popular in this group. '10,261 In this study, the fat consumption of 29.07% of the total energy intake as measured by the 24-hour recall was within, but on the high side of the WHO goal of 15 - 30%. '171 This was also reflected in the top 20 food intake data where polony, fried chicken, fried egg and carbonated cold drinks represented numbers 6, 13, 16 and 20, respectively. CHO-rich foods appeared more frequently in the lunchboxes than in the daily intake. In many of the lunchboxes, high-fat items such as polony (2nd), margarine (5th), cheese (8th), fried potato chips (10th), fried egg (12th) and fried chicken (14th) were present. The high-fat items ranked higher on the lunchbox list than on the 24-hour intake list, indicating that the lunchboxes were energy-dense. Food items high in sugar also appeared frequently (2nd, 5th, 17th, 18th and 19th) in the daily intake and 4th and 9th on the lunchbox list. This finding was consistent with the notion that the diet of SA adolescents and youth is characterised by a high intake of cold drinks, further contributing to obesity. '61 In a study of adolescents in SA, Feeley et al. reported that the most popular lunchbox items, among others, were cheese, bread and fruit, making up >50% of the lunchbox foods; in this study these were also present but leftover foods from home meals also appeared on the lunchbox list (11th, 13th, 14th and 15th). The adolescent and youth diet is further characterised by low intakes of milk, fruit and vegetables. Fruit and vegetable intake in the girls in this study was much lower than the recommended intake of >400 g/day. This confirmed findings by Larson et al. in a study among adolescents in the United States. The low milk, vegetable and fruit intakes are associated with low calcium, iron and vitamins A and C intakes; this may have contributed to the inadequate micronutrient intakes in this study. The majority of the girls consumed a diet low in calcium (29.52% of the DRI), which was also reflected in the top 20 food intake lists; the lunchboxes had no dairy foods that could contribute to calcium except for cheese (42.08 g), consumed by 12 participants. The lunchboxes contributed at least 50% of the vitamin C intake of the girls. Although the mean iron intake was adequate, 49.1% of the girls did not meet the EARs. The B vitamins are very important for cognitive development and behavioural outcomes in children and adolescents. In this study, all participants showed adequate mean intakes of the B vitamins, but large percentages of both groups did not meet 100% of the DRIs for these vitamins. The study is significant as 39.1% («=61) of the girls who agreed to participate brought food from home and the lunchboxes contributed ~33% of the daily intake of the girls; this should therefore reflect a balanced daily intake for adolescent girls from all the various food groups. This is one of the first studies to report on the contribution of lunchboxes to the dietary intake of adolescent girls as a group in KZN. Thirty-eight per cent (n=156) of parents gave consent for their children to participate in the study; this could be seen as a limitation, as a bigger sample size would have strengthened the generalisation of the study to the larger KZN community. It is estimated that 61% of the KZN population live in poverty and 28.2% are at risk of hunger, which could explain the poor diet quality of the girls in this study. [111 This could be the result of poor food consumption patterns that do not meet the SA Food Based Dietary Guidelines (FBDGs) goals for health, thus compromising optimal nutrient intakes. Adolescence is characterised by nutritional vulnerability due to growth and associated high nutrient requirements, as well as poor eating habits and risk-taking behaviours. Adolescents are the adults of the future and it is likely that their dietary habits will continue into adulthood. Research has shown that diet is an important factor in the prevention of chronic diseases and obesity, and nutrition is one of the important modifiable determinants of chronic diseases. It is important to address the underlying causes of inadequate food consumption that result in a poor nutritional status. Availability and accessibility of healthy foods, the frequency of family meals, and parental intake and parenting practices are important factors to assist adolescents in making healthy choices. Household food availability and accessibility plays a major role in a young adult's food intake. Research efforts can be concentrated at schools and among parents to change intake habits in specific settings, as children spend up to 8 h/day at school. The FBDGs should be used as a basis for nutrition education programmes. Management at schools, post-school training institutions and the workplace should be targeted to provide healthier options in tuck shops, dining rooms and canteens for young people to be able to make correct choices regarding nutrition. Acknowledgements. This research uses data from two different studies conducted by the Department of Food and Nutrition Consumer Sciences at Durban University of Technology. We hereby acknowledge the students for data collection. The schoolgirls are also acknowledged for participating in the study.